Between 2013 and 2015, 10 Bulgarian municipalities spent a total of 2.7 million Bulgarian lev ($1.54 million) – mainly to media companies and PR agencies – in return for positive coverage of their activities, an investigative series by news site Dnevnik.bg found. According to the articles, the local governments of the five largest, excluding the capital Sofia, and five of the poorest cities in the country were found to be engaging in “corrupt practices” and displayed a disregard for “journalistic ethics and loyalty to the audience”. Under the guise of using contracts to create advertisements, “job posting messages and other texts” – not only in publications but also for radio and television broadcasts – all 10 municipalities were found to be buying influence in media outlets and attempting to eliminate criticism, Spas Spasov, the author of the series, told Index on Censorship. The cities reviewed were Plovdiv, Varna, Burgas, Ruse, Pleven, Stara Zagora, Shumen, Kazanlak, Blagoevgrad, Vratsa and Montana. The data, which was obtained through freedom of information requests, does not claim to be exhaustive but provides an indication of administrative control over news in the cities covered by the investigative reports. 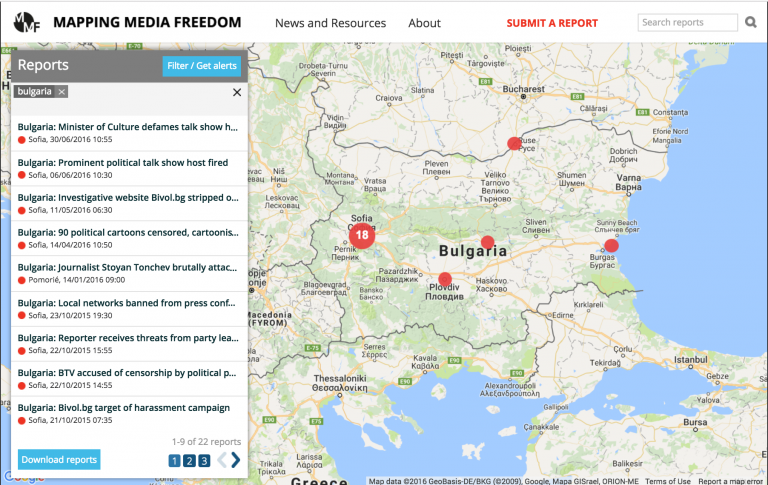 “The idea behind the project was to reveal the deep crisis in which freedom of the press finds itself in Bulgaria,” Spasov said. One visible trend in the series is that media content is sold at a discount to local governments who buy “wholesale”. “The results of my investigation show that virtually all the media in the analysed municipalities are dependent on the public funding they get,” Spasov told Index. The lack of an advertising market outside the capital only strengthens this dependence on handouts from local government, he added. He found that in many cases the money private media outlets receive from municipal administrations often covers the entirety – or at least a significant portion – of their budgets. In one case a source told Spasov that the entire salary of a journalist was covered by Vratsa municipal funding. In the city of Varna some advertising contracts were signed by municipal companies that are monopolies that were not in need of advertising. Spasov said that this is a way to buy political and institutional influence in a media outlet. Many municipalities were found to be contracting “advertising” and “promotional activities” through private media despite the fact that almost every municipality has its own municipal media, through which they already publish official announcements. “Of course, there is nothing vicious in the practice of municipal administrations buying advertising in private media,” Spasov said. He does, however, stress that in order to avoid buying media influence, local administrations and government institutions should publish their advertisements only in media outlets that comply with the Ethical Code of the Bulgarian Media. “This code clearly stipulates that all text covered by the contracts will be marked as sponsored content but this is not the current practice,” he said, adding that vague wording–phrases such as “other texts”–helps to disguise sponsored articles published as editorial content. This is possible because Bulgaria has no law requiring print and online media outlets to label sponsored content they are publishing. Existing regulation only addresses television advertisements. “Transparency of sponsored content is crucial for a functioning free press. It is vital that existing legislation on advertisers be reformed swiftly to include all media outlets in order to protect the public,” Hannah Machlin, project officer for Index on Censorship’s Mapping Media Freedom, said. The investigation went on to find that many media outlets from smaller municipalities were created by political entities with the purpose of bullying their opponents in local government. Spasov told Index that if the remainder of the country’s 256 municipalities were also to be investigated, “there should be no doubt” that the findings would be similar to the 10 which were analysed in his investigation.